Reads like a gasping, gossipy small town soap opera. As I've said with the previous books, I really enjoy this series. I found it interesting this time that I read this book right after I read Union Quilters. While the setting for Quilters was during the Civil War, Retribution centers around a reenactment of one of the battles of the Civil War.Lucie Montgomery, owner of the Montgomery Estate Vineyard, barely escapes being killed by a tornado that rips through part of the vineyard. After crawling out from under a bridge, she discovers a skull that was obviously unearthed by the tornado. If the unidentified skeleton were her only problem, life would be OK; but, of course, it's not. There is a conflict between Quinn and Chance, the new farm manager; someone is apparently stealing credit cards; her brother and SIL are having money troubles; and someone in her family may be accused of murdering the person whose skeleton Lucie found.This is definitely one of those series that you have to read in the order in which the books were written or you won't have a clue about the characters. I'm glad Jaci discovered this series. Well, this was a pleasant little mystery - not too demanding, not too fluffy. It has some interesting characters and some that are fairly two-dimensional. I enjoyed the detail about the wine business and the bits about the historical reenactment of a Civil War battle. I thought there was a bit too much exposition of backstory. If you've already read the previous books in the series, it's unnecessary; if you haven't, it's unnecessary. This was an okay read, I haven't read this sort of mystery novel in a while, so it is a different reading experience. For me this was very anti-climatic, every time the author hinted something major was going to occur it was some little thing. Interesting wine and vineyard information, but that didn't save the story for me. I am annoyed because I wrote an extremely detailed and carefully thought out review and bloody internet ate it!!! (should have used word I suppose)To recap more briefly. I hated the stereotypes and gendered interactions in this book. Especially the boof-head behaviour of the males (and the stereotypical ways the females were flawed)I loved- the setting, the problematisation of "illegal" labour and the compassionate view of the human dignity (also economic necessity of small business owners) with the preoccupation with a "fair" wage. YES.I liked- the disabled protagonist. The way she rescued herself at the final showdown and the palusible backstory which allowed this. Some of the banter between her and the generally unlikeable romantic lead.I was not thrilled by- the fragmented plot, the lack of strength or holding together of one narrative strand (one mystery), the predictability of all the twists (bar one which I really did like a lot)I think the people (who allegedly exist) who found 50 shades of grey "romantic" would really enjoy this book, for the rest of us it is far from the best but also far from the worst read available in its genre. It integrated its wine-making knowledge in a very readable way and avoids the clumsy info-dump. I wont be rushing out to read them all though. I just love the way Ellen Crosby introduces history into this wine series, and the Riesling Retribution is no exception. A sub plot about a Civil War re-enactment happening near to her vineyard - with the participants camping out on her land - adds an intriguing extra to this tale of long hidden family secrets. The battle of Ball's Bluff happened three months after the Union Army lost the major fight at Bull Run, the first great land battle of the conflict. As Crosby tells us in Notes, there is a 223 acre Ball's Bluff park near a shopping mall in Leesburg, Virginia, (with the third smallest military cemetery in the US), which you can visit and which some still swear is haunted. I just love the idea of going on a "history trail" following the thread of these stories - I guess some people probably already are doing that. Lucie is still battling to make her vineyard truly profitable, while having to deal with finding a body buried amongst the vines. The story is slickly plotted, and lots of interesting wine information is included. I'm definitely hooked on the series and want to know what happens both to Lucie and Montgomery Estate Vineyard next. The writer tells a good story and I enjoy the research on such places as the Balls Bluff battle. It does make we want to go visit the area. However, her character Lucie, who owns a winery seems more interested in family matters and murder than the problems going on in the winery. I highly doubt if a vineyard had this many problems going on the owner would act so nonchalant about it. But of course, it is a work of fiction and I do so enjoy anything that has to do with wine :)If you enjoy an easy to read murder mystery then this series is for you. It's a go to series when I'm not looking for anything to complex. A tornado tore through Lucie Montgomery's vineyard destroying valuable vines and unearthing a skeleton in an unused part of her property. The police suspect that a member of her family committed the murder 20 to 30 years ago. Misplaced equipment and other unusual incidents are happening around the vineyard. Lucie is determined to solve both mysteries. Fourth book in the series. Getting to solving the crime took a little too long for me. As were similar to books 2 and three, lots of detail about Lucy's life that I didn't seem relevant. It's turning more into a love story than a mystery. I think this will beThe last book for me. This is one in a series of easy to real mysteries. They are continuing so I am now looking forward to the next one. Even if one doesn’t know the difference between a dodine and terroir, Ellen Crosby’s cozy mystery series (Wine Country Mysteries) about a single woman of a certain age revitalizing a Virginia vineyard is a tantalizing read. Lucie Montgomery, the protagonist of these books reminds me of some of the women in my life—don’t ever tell them they can’t (to which my youngest daughter retorted, “Just watch me!”). When Lucie was told after an automobile accident that she would never walk again, she proved the doctors wrong (although she does accede to the use of a cane). She resents being helped and would serve as an ideal model for a poster on respecting the “handicapable.”Upon being told that she could never make a “go” of the family’s vineyard because her father had run it into the ground to pay his gambling debts, she proves them, at least temporarily wrong. They are “temporarily wrong” because there are one or more crises hanging over the vineyard at any point. Sometimes they are business-related, sometimes they are weather-related (common to viticulture), and sometimes they are public relations traps. Regardless, Lucie is an interesting protagonist because of her insatiable curiosity with regard to the mysteries which invariably crop up while the rest of her life faces threats as well. The Riesling Retribution involves a cold case that arises from one of those threats to the vineyard. On top of a devastating loss, comes the obligatory unwanted discovery of human remains. This time, there is a twist. The murder occurred three decades before the events of the book and the main suspect is dead. Weave in a romantic triangle that may just be in Lucie’s mind along with anger toward her best friend , embroider this with an American Civil War reenactment and some financial problems regarding her brother and you know this novel isn’t your mother’s “afghan.”In many ways, The Riesling Retribution is more satisfying than the first three and I’ve enjoyed all of them. There’s just something about Lucie’s vulnerability in this one, the point at which she has to grapple with her limitations and, perhaps, those of people around her. There is more than one mystery in this volume and those mysteries don’t all deal with murder. There is a mystery around accidents and problems at the winery and there is a mystery concerning one of the “other” women involved with Lucie’s father. It’s probably the quickest page-turner of the bunch. At least, it was for me. I was also delighted to have found a vital clue in the dialogue on page 195. If you read this review, I hope you’ll note the page and check out the statement made by one of the suspects that indicates that said suspect knows more than is otherwise thought. And our insightful protagonist completely missed it. That was a very, very nice touch. #4 in the Wine Country mystery series. This is an enjoyable continuation of the Lucie Montgomery saga in Virginia horse and wine country. The problem is that the central plot device tying a new found skull to Lucie's disreputable, deceased father is too thin. Lucie worries that everyone will assume her father killed the victim - so of course everyone, including the sheriff's office, assumes just that and with only flimsy circumstantial evidence close the books on the case finding her father guilty. It would have been a better book if the evidence against her father was more compelling or if Lucie didn't spend so much time worrying about his reputation.Wine Country mystery - When a tornado rips through Montgomery Estate Vineyard, it not only destroys some of Lucie Montgomery’s newest grapevines, it also unearths an old grave. After the dead man is identified as a former business associate of Lucie’s father, it seems everyone in Lucie’s hometown has already decided Leland Montgomery is a murderer. As the evidence piles up against him, Lucie sets out to prove her father’s innocence. But Lucie has more on her mind than a dead body. Her new vineyard manager has accused her winemaker, Quinn Santori, of abusing the vineyard’s migrant workers, while Lucie’s relationship with Quinn grows increasingly more complicated. Meanwhile, Lucie has given permission to a group of Civil War re-enactors to recreate a local battle on her farm. But when one of the re-enactors is shot with live ammunition, Lucie wonders whether it was an accident or an attempt at murder. Strange occurrences are afoot at the Montgomery Estate Winery, leaving everyone scratching their heads about why equipment keeps breaking, harvest isn't being executed properly, grapes are not fermenting, and credit card numbers of patrons and employees alike are being stolen. Could it be that the winery's new employees - Chance and Tyler are to blame? Then, when a tornado uncovers bones from a 30-year-old grave, signs point toward a member of Lucie Montgomery's family - here deceased father. Lucie won't let sleeping dogs lie and in getting to the bottom of this mystery, she alienates friends and family, pursuing a truth that not only hurts, it places her own life in danger. Old lovers and new lovers surface in a novel that leaves the reader with poor resolution to the story. While their is retribution for the killer(s), the perpetrators of various crimes end up walking free as Lucie is left holding the bag on a lifetime of sorrow. While I love this series and highly recommend Crosby's previous novels including the Merlot Murders and Chardonnay Charade, this installment leaves a lot to be desired. I'm looking forward to the Voignier Vendetta and hope that Crosby will do a better job of resolving her next Montgomery Estate mystery! As always, the mystery plots were intriguing and difficult to unravel though at least one culprit was obvious from their first appearance and Crosby did nothing to hide their sliminess from the reader or most of the other characters so the ultimate reveal lacked power and excitement without diminishing enjoyment or tainting the other unanswered questions. The ongoing secondary plots and relationships continued to develop in a pleasing and interesting way but Lucie’s gullibility; an unquestioned and puzzling willingness to believe the word of almost strangers, and continued questionable interactions and interest with and in new men book after book makes me question her emotional intelligence, which showed little sign of growth until the closing chapters. In a way, Lucie’s character seemed stagnant while everyone around her continues to grow and surprise. The book left me with mixed feelings, mostly positive but a bit exasperated as well. A 3.5. 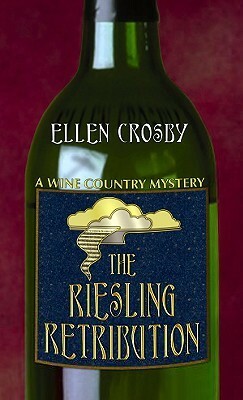 In the 4th book of the Wine Country Mysteries, Riesling takes center stage. Riesling is one of my favorite wings and perhaps that's why I nudged my rating up to 4 stars! Lucie Montgomery is the owner of the Montgomery Estate Vineyard that is located in Virginia. She has given her approval to Civil War reenactors to use an open field near the vineyard for a reenactment of the Battle of Ball's Bluff. A tornado rips through the vineyard and unearths a grave. Who killed the man in the grave? Was it a relative of Lucie's? How much damage did the tornado cause to the vineyard? Why won't the Riesling "make"? Lots going on including a discussion about ice wine (which I've found to be a tasty but bit pricey treat). I really enjoy the characters. Lots going on in the Montgomery family. Smoothly written. Lots of information about vineyards and civil war history in Virginia. Never a dull and boring moment. The second book I've read in the series set in the wine country of Virginia. After a tornado roars through the vineyard and a cemetery on the property, Lucie finds a partial skeleton that had been buried in an unmarked site. When the skeleton is identified as a man with whom Leland, Lucie's father had had a disagreement, Leland becomes the primary suspect. Lucie attempts to rescue her father's reputation and well as that of the vineyard. Not a bad story line but I really enjoy the back story of winemaking and in this book I learned the intricacies of ice wine and why it is so darn expensive. I rather wish I had read them in order since I now know what occured in earlier books but they are still a fun read. None of these Wine Country Mystery books are particularly well-written or well-edited, but until now, I've kept reading them because, for me, their entertainment value outweighed those problems. But I won't be reading any more. My love of visiting Virginia wineries isn't enough to overcome the mistakes. For example, on page 6: "I retrieved my phone. Still no service." and then again on page 13: "He drove me by the broken-down Gator so I could retrieve my phone, which still showed no service." Or to overcome the foreshadowing that has all of the subtlety of a sledgehammer. For example, "I wanted the truth to be revealed, not more senseless deaths. Little did I know that I would not get my wish." Seriously? This is the first book I've read from this author, and I'm not a fan. While the setting is interesting and unique, I didn't care about any of the characters. This might be my fault for not reading the first three books in the installment, but I did the same thing with the Janet Evanovich stories, fell in love with the characters, and went back to read the other books. That's what should happen when you pick up any book, but it didn't happen for me with Crosby's book. When an author verbally sets up cliffhangers (ie: "But she had no idea what would happen next...")I worry. If I can't feel the suspense without the author telling me to feel the suspense, there's something wrong. Lots of telling in this book, and not much showing or feeling. I think Ellen Crosby has hit her stride in this series with this installment. I really think it's my favorite thus far. I like the way that the two mysteries were intertwined with each other. The fact that there was more than one thing going on at a time kept the readers interest and kept them guessing. I like the way that Lucy's relationship with Quinn has evolved but given how much they bicker over wine I kind of wonder how it will fare over time. Generally I think I will continue reading the series and have enjoyed the authors interesting commentary on both history and winemaking in Virginia. This is fourth in a series of cozies set in the wine country of Virginia. I enjoy the characters and the setting but, in this one, the main character and owner of the family business and winery seems a bit non-responsive to the multiple acts of sabatoge occurring around the winery. In addition, a tornado hits the area and unearths a 30-year old grave on the property that leads to accusations of murder by her deceased father. While the plot is interesting, the ending was unresolved and felt unfinished. Ellen Crosby sure can create a world I can get lost in - the vineyard, the house on the vineyard, the adjoining wine tasting rooms and restaurant - scenic and pure escape. I started out thinking this book would be my fave in the series - an old skeleton found on the outskirts of the vineyard, and a Civil War re-enactment on her property (Lucie's property, the main character and determined vineyard owner.) But, the mystery petered out and the end, well, abrupt. All a reader can do is enjoy the ride, but don't expect much at the destination. Crosby fashions a nifty mystery with realistic, complex characters and situations, all against the backdrop of Virginia wine country. Her protagonist Lucie is all too human and vulnerable, trying to keep her winery (and personal sanity and integrity) together against an onslaught of trying circumstances. This novel, and others in this series, are not your typical find-the-killer mysteries in which the actual murder is peripheral to everything going on around it. Crosby connects everything masterfully. This was a quick and easy read. Cute storyline - tornado uncovers a skeleton at a winery and leads to an investigation which reveals skeletons in the closet of the lead character's family, though she was already aware that the family was not without fault. Not entirely predictable- I did wonder which man she would end up siding with until it was revealed, though at the same time felt that this piece was more contrived than the rest of the storyline. I also wrestled with who the sabotuoer was until it was revealed. I'm likely to read more of this series when I'm looking for light mystery. This is the fourth book in the Wine Country Mystery series. This time the Montgomery Vineyard is hit by a tornado which unearths a human skull. Lucie Montgomery learns that the bones to a man who had argued with Lucie's father before he went missing. Lucie is determined to clear her father's name. Also the vineyard is having a series of accidents but Quinn isn't sure they are accidents. Also Lucie and Quinn take a step toward a relationship. The book was a quick easy read. Any mystery that involves winemaking and vineyards has to be a good read and this is no exception. The mystery itself is a bit weak but the characters, the Central Virginia setting, and all of the viniculture makes this a book worth reading. The story involves some Civil War history and glimpses into the re-enactment subculture, so there's lots to recommend. I'm going to check out others in this series. Glad to be back into the fun of mysteries!